Space Vermin From Beyond! 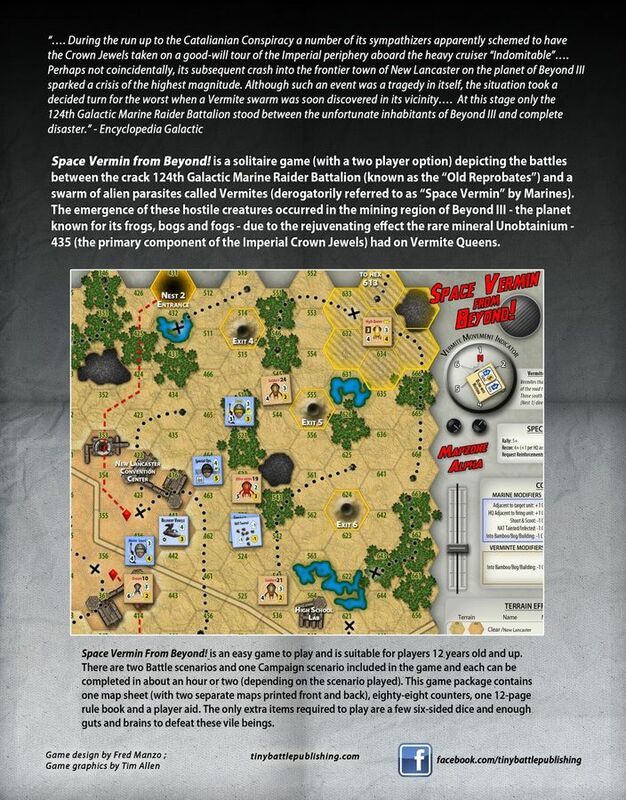 is a solitaire game (with two player action… uh, option) depicting the battles between the crack 124th Galactic Marine Raider Battalion (known as the “Old Reprobates”) and a swarm of alien parasites called Vermites (derogatively referred to as “Space Vermin” by the Marines). Space Vermin From Beyond! takes place on Beyond III, a planet known for its frogs, bogs and fogs. 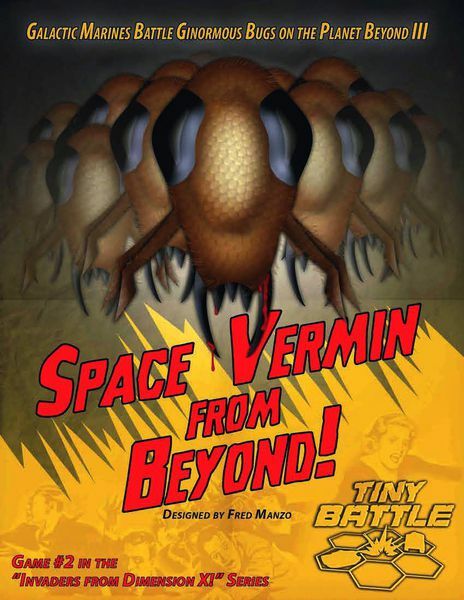 Easy, fast and rated PG-12, Space Vermin From Beyond! is the second game in Hermann Luttmann’s extraterrestri-awesome Invaders from Dimension X! universe. Space Vermin From Beyond! equips you with; one map sheet (with two separate 12.5” x 18.5” color maps printed front and back), eighty-eight kick-a$$ counters, 2 separate Player’s Aid cards and a 16 page booklet, including 12 pages of rules, two Battle scenarios and one Campaign scenario. It uses a chit pull system to generate Random Events and regulate the direction of the Vermite horde. This randomness enhance the alien theme and culture-shock for us Earthlings! Battling these nasty varmints on Beyond III may take up to 2 hours (depending on the scenario chosen). But there ain’t no “high-noon” in space, so you take your dang time. Bring a few D6, your spine, brains and guts to defeat these vile space insects and save the defenseless population of Beyond III from total extinction! Attack of the 50 Foot Colossi is a tactical hex-and-counter wargame, which provides players with ore carriers full of solo fun and excitement. As the battle-hardened 124th Galactic Marine Raider Batallion, fight to save miners on a remote planet from colossal rock monsters. Invaders from Dimension X! is an easy-to-play solitaire game (with a two-player option) that begins the story of the brutal war between the invading alien Kay’otz race and the only human force capable of defeating them. You control the various Marine squads, each with a specialized skill, as they fight their way through an alien enemy that is totally unpredictable.